Cama-i’s Living Treasure, Cikiigaq Joe Ayagarak Jr. of Chevak, performs a solo dance with the Yurartet Singers and Dancers at the Cama-i Dance Festival at Bethel Regional High School on March 29, 2019. Chevak never stopped dancing. When the missionaries came, the villagers buried their drums, later unearthing them to continue their dance tradition. This year’s Cama-i’s Living Treasure, Cikiigaq Joe Ayagarak Jr. of Chevak, inherited that tradition. In the 1980s he brought it to Kwethluk, where it’s continued ever since. This year, Ayagarak Jr. met his legacy on the Cama-i stage. Olga Uttereyuk is nervous. It's her first year teaching yuraq in Kwethluk and her first year performing at Cama-i. Uttereyuk learned dancing from Joe Ayagarak Jr. She was a senior in high school in 1985 when he came to Kwethluk as a teacher and brought yuraq back to the village. One of those children is Kwethluk senior Tiger Lee, whose mother learned to dance from Ayagarak Jr. When Ayagarak Jr. enters the backstage area, Lee approaches him, shaking his hand, saying, "Quyana for bringing yuraq to my village. I wouldn’t be here without you." Lee is one of Kwethluk's most expressive dancers. “When you have emotions that you want to take care of: anger, sadness, regret, it’s a good way to cope with anything that you’re going through,” he explained. "My generation caught the last leg of the qasgiq, men’s bath house," he explained, "and that’s where we learned Native dancing." His father created many yuraq songs. When the older men would go seal hunting, Ayagarak Jr. led the younger boys who stayed behind in dance. From the beginning, yuraq was essential to him. 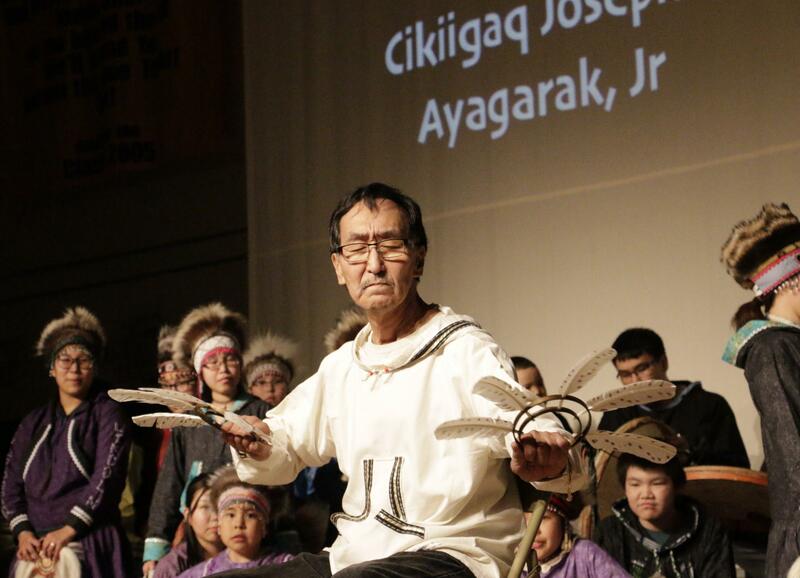 So when Ayagarak Jr. and his wife moved to Kwethluk as teachers, he took dancing with him. The village had not seen dancing in generations. He found that he couldn’t teach them the traditional way by just showing them the moves. A Cama-i coordinator then comes backstage and gives the Kwethluk dancers some news. Another dance group wasn’t able to make it. Kwethluk will have to go on early. During the group's final song, a song that Ayagarak Jr. composed, the dancers get a surprise. Beating a drum, Ayagarak Jr. joins Kwethluk on stage. He wears fur mukluqs and a cream-colored kuspeq trimmed in gold. The spotlights glint off his glasses, and his voice carries loud and strong. With him on stage, the music and singing grows louder. The dancer’s movements become bigger, knees bend deeper, arms reach further. Everything becomes more than it was.